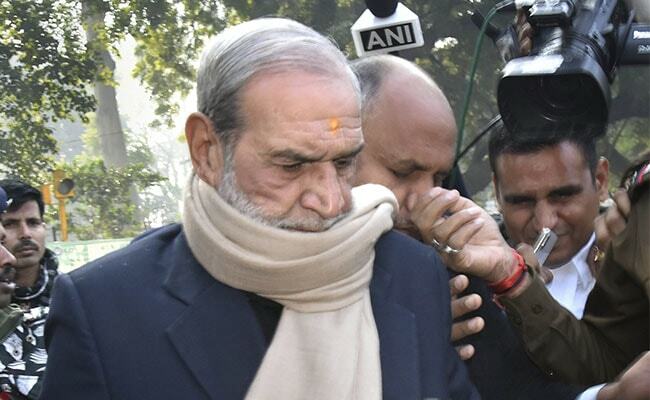 Former Congress leader Sajjan Kumar was convicted and sentenced to life in a 1984 Anti-Sikh riots case. Sajjan Kumar has approached the Supreme Court challenging his conviction. The Central Bureau of Investigation today opposed former Congress leader Sajjan Kumar's bail plea in the 1984 anti-Sikh riots case in the Supreme Court today, saying that he was the "kingpin" of the massacre and to grant him bail would be a "travesty of justice"
Sajjan Kumar had moved the Supreme Court against the Delhi High Court verdict that awarded him life imprisonment for the "remainder of his natural life" in the case. He has also filed an application seeking bail. His application came up for hearing before a bench of Justices SA Bobde and SA Nazeer today. Appearing for the CBI, Solicitor General Tushar Mehta opposed his plea. "The massacre of Sikhs is a gruesome offence. He was the leader of the massacre," he told the bench. The case in which Sajjan Kumar was convicted and sentenced relates to the killing of five Sikhs in Delhi Cantonment's Raj Nagar Part-I area on November 1 and 2, 1984. During the arguments, the counsel representing Sajjan Kumar told the bench that a key witness in the case had earlier given four statements in which she had not named him but later, she mentioned him in her statement. Mr Mehta also told the bench about the circumstances in which Sajjan Kumar was granted anticipatory bail and argued that a violent mob had gathered at his residence when CBI team had gone there during probe into the case. The bench was also told by one of the advocates that Sajjan Kumar was a sitting lawmaker in 1984 and several Sikhs were killed during the riots in his constituency. "Today, you (Kumar) are convicted by the high court. It is not a charge by police. We cannot treat it lightly." The bench, however, asked the CBI to apprise it of the status of the ongoing trial in the case involving Sajjan Kumar and listed his bail plea for hearing on April 15.